Consequent on release of Meghdoot Update 7.9.3 on 09.10.2015, the following new requirements/ orders have been issued by the Directorate. 1) PA Wing, Directorate letter F.No. PA Book I/ST VOL VI/2015-16/D-4460 TO 4510 dated 09.11.2015 communicating the Service Tax Notification for introduction of Swachh Bharat Cess @ 0.5 % wherever Service Tax is applicable w.e.f. 15.11.2015. 2) Directorate of PLI letter No.29-9/2013-LI dated 16.11.2015 communicating the Swachh Bharat Cess applicable on PLI/RPLI Premia @ 3.62 % [Service Tax 3.5% and SBC 0.12%] on First Year Premia and @ 1.81 % [Service Tax 1.75% and SBC 0.06%] on Renewal Premia collected. 3) Directorate, New Delhi letter No.1-20/2014-15/T&C dated 26.11.2015 communicating the Gazette Notification for revision of foreign postage rates on letter post items w.e.f. 1.12.2015. In addition to the above major requirements, many other minor modifications/improvements have been done and hence this release. Complete list of enhancements/modifications in each module are furnished in Section 5 of this document. 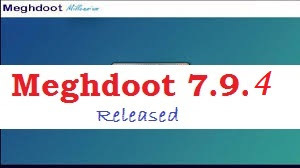 Meghdoot Update 7.9.3 released on 09.10.2015.